This rich and decadent dessert is the perfect gift for Mom on Mother’s Day. 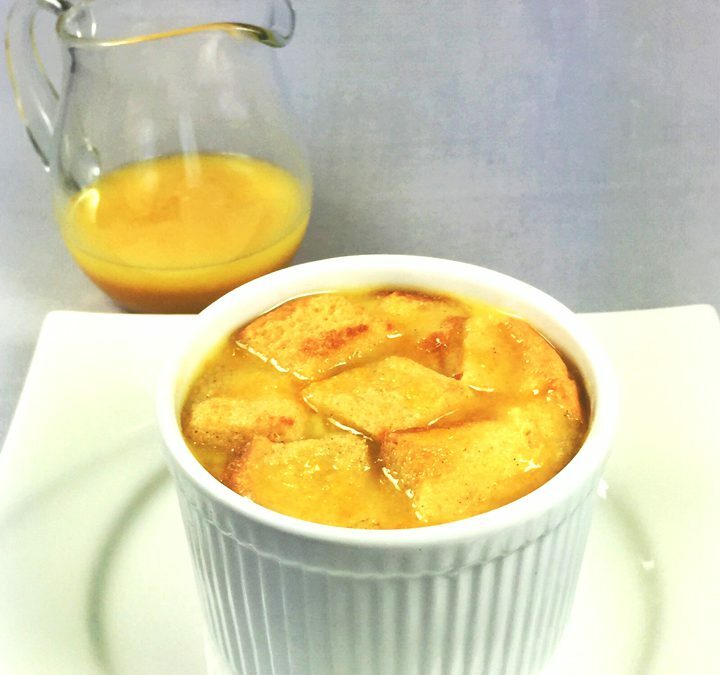 A sweet and thick Grand Marnier custard is poured over layers of cubed Brioche bread, then baked in the oven and topped with a warm Orange and Grand Marnier Sauce making it truly a comfort dessert. 4 cups 1” cubed brioche bread, day old preferred. In a large bowl, whisk the eggs and Half and Half until thoroughly combined. Add the sugar, Grand Marnier, cinnamon, and vanilla. Whisk again until combined. Fill four 12-ounce soufflé or custard dishes with the bread, evenly divided. Pour the mixture over to cover. Rest for five minutes and add any extra liquid over the bread. Let stand, pressing down on the bread occasionally, until it is evenly soaked, about 20 minutes. Preheat the oven to 350°F. Set the dishes in a large, shallow roasting pan. Add very hot tap water to the roasting pan to come halfway up the sides of the dishes. Bake the pudding until a knife inserted near the center comes out almost clean, 30 to 40 minutes. Serve warm or at room temperature with the sauce. In a small saucepan over medium heat, add the strained orange juice, sugar, and finely grated orange zest, stirring often until the sugar dissolves. Increase heat and bring to boil. Cook for 3-4 minutes until the mixture becomes syrupy. Add the butter cubes to the saucepan, a few at a time, while whisking constantly. When thoroughly blended, remove from heat and whisk in the Grand Marnier. Serve poured over the bread pudding.